The Roanoke Island Maritime Museum is located in downtown Manteo on the waterfront. 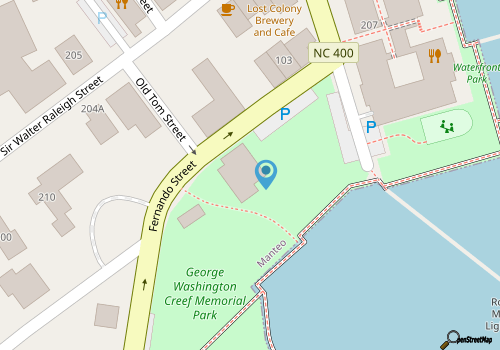 The Museum is the former and historic George Washington Creef Boathouse. Creef was a local builder who developed the shad boat, a fishing vessel designed especially for local waters. She was build sturdy to withstand rough sound waters. The shad boat also was built wide to carry lots of cargo and sports a shallow draft. The shad boat eventually was named the North Carolina state boat, and you can see the real deal at the Museum. They have small watercraft on display to represent the area’s maritime heritage. This includes an 1883 shad boat, a clipper yawl boat and a1960s hydroplane that locals once used in racing. The Museum also is a working boat shop. It is the site where Roanoke Island Festival Park’s Elizabeth II was built, which is a composite replica of the ship, Elizabeth, which came from England to the island in the 1500s. The boathouse also is where eight Optimist Prams were built by volunteers in 2001 for the Museum’s Youth Sailing Program. Artisans work projects at the Museum including boat restoration and construction. Summers find the boathouse to be the perfect site for sailing programs. Call them for details. You can visit the Museum year round.